IMPORTANT: This offer is valid until 12pm (noon) on Saturday. The race is at 5:15pm, but ALL bets MUST be placed before noon. Any bets placed after 12pm noon will not qualify. So get all of your bets done on Friday, or Saturday morning at the VERY LATEST or you WILL MISS OUT!! 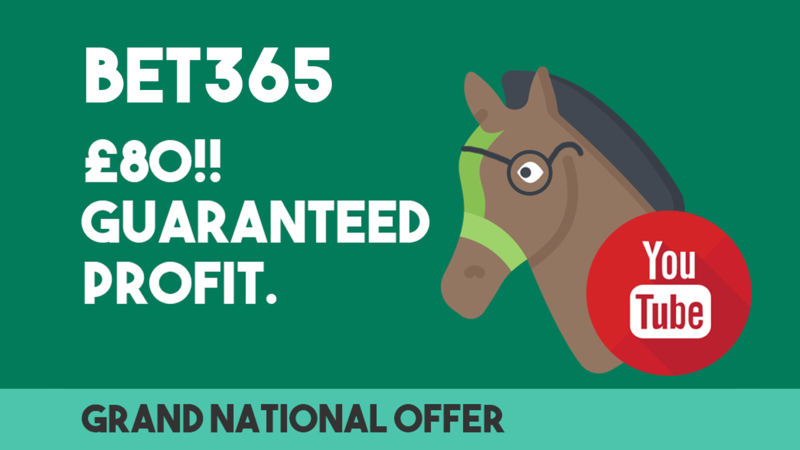 Bet365 have an AMAZING offer for the Grand National race this year, which is taking place at 5:15pm on Saturday. The offer is Bet £125 each-way (£250 total), and get £125 cash added to your account! The £125 cash has no wagering and is withdrawable and we can guarantee around £80 profit from this offer! Please Note: This offer is not valid for new accounts created after 23:59:59 03/04/19. Each Way Bets - What Are They?! Ok so firstly, what on earth is an each-way bet? You may have heard of it before but have absolutely no idea what it is! An each-way bet is where your bet splits into two different bets; one bet on the horse to win, and one bet on it to place. To place simply means to finish 1st, 2nd, 3rd, 4th, or 5th etc (the amount of positions the place market pays purely depends on the race). The term each-way refers to winning, and placing. Think of both of those as a "way", and so betting £10 "each way" is betting £10 on the horse winning, and £10 on the horse placing. Lets say you bet £10 each-way on Ladbrokes on a horse, you would be actually be betting a total of £20. £10 will be on the horse to win the race, and the other £10 will be on the horse to finish 1st, 2nd, 3rd etc (the amount of places depends on the race). When you place an each-way bet on a horse using Matched Betting, you will have to lay both of the bets separately. Firstly you will lay £10 on the win market to cover the win half of the bet, then you would lay £10 on the place market to cover the place part of the bet. How to profit from the offer! Still confused? Don't worry! Let's go through exactly how to do the Bet365 offer. We are going to split this up into some simple steps. Don't be put off by the fact there's 6 of them. They're VERY easy and repeatable. It's an easy £80, so spend a good 10 minutes reading it first! The very first thing you want to do is deposit into Bet365. 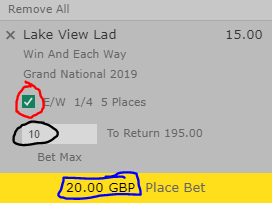 I originally said to deposit £250 as you're betting £125 each-way (£250 total), HOWEVER, when you place a £10 each-way bet (£20) Bet365 are only deducting £10 from your balance. They're basically placing the £10 place bet for you, for free. So for this reason, you may want to deposit £125 to start with, and then top up if you need to. Choosing a horse is perhaps the easiest part. Just pick a horse that has close back & lay odds as normal. The best thing about this whole offer is that you don't have to place the £125 each-way all in one go - you can spread it across as many horses as you like! If you have a bank of around £1k+ then I'd advise picking 5 separate horses and betting £25 each-way on each horse. That'll be 5 x £25 each-way bets which is £125 in total each-way (£250 total). If you have around £500 to £1000 then you should pick around 10 horses, and vary stakes from £10 each-way to £15 each-way. The reason I've suggested those values is because you need enough exchange liability. As soon as you bet on two horses, the liabilities will combine anyway. However the place liabilities won't combine until you've bet on 5 horses, because it is possible for 4 horses to all place. Once you've found a horse, it's time to calculate the bet. You want to bet £10 each-way on Lake View Lad. Add the horse to your betslip as you normally would. Lets take a look at what it will look like. Tick the box circled in red to place an each-way bet. Leaving it unticked will just place a normal bet. Put half of your total stake in the stake box circled in black. So if you want to do £10 each-way (£20 total), then put £10 in the box. Check the total amount circled in blue is the amount you want to bet in total. This is what will be deducted from your Bet365 balance. You now have £10 each-way (£20 total) on Lake View Lad. This is two separate bets: £10 for Lake View Lad to win and £10 for Lake View Lad to place. You now need to lay the win bet on Lake View Lad, as £10 is on the horse to win. Simply open up the exchange you're using and lay Lake View Lad as normal, using the calculator in normal mode. You've backed and layed £10 on Lake View Lad to win, but you still have £10 unmatched on the horse to place. This is the bit that scares people, but it's very easy! Firstly you need to work out the place odds. The odds to win were 15.0; the place odds are different. To work them out, lets look at the bet slip again. Look at the red circle. This says "E/W 1/4". What this means is that the each-way odds (place odds) are 1/4 of the normal odds. Occasionally you'll see some bookies saying 1/5. If this was the case, you'd literally just work out what 1/5 of the normal odds are instead. (Odds - 1) ÷ 4, then add 1. The Place odds for our horse are 4.5! Easy! We've backed £10 at 4.5 for the horse to place, so lets go lay it! You can lay the place bet on all of the major exchanges; Betfair, Smarkets and Matchbook. There is one MASSIVELY IMPORTANT thing you need to take note of though, and that's the amount of places paid by the bookmaker. Lets refer back to the betslip. Look at the blue circle. This says 5 places. That means Bet365 are paying out the place bet as a winner, if your horse finishes in the top 5 (including 1st). To make things risk free, we need to make sure that the market on the exchange is the same or less than 5 places. If it is above 5 then our funds are at risk! 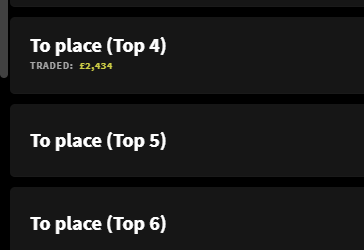 Betfair have markets for "win", "place", "5 places", "6 places". Place = The standard amount of places. With any race, all bookies will have a standard amount. For the Grand National its 4 places. You are safe to lay here, as this is less than 5 that we have on Bet365. 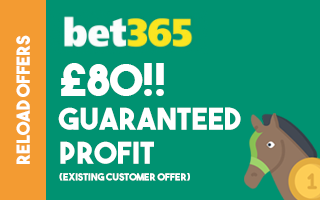 You can benefit using this market when your horse finishes 5th, because you will win the place bet on bet365, and you will also win your lay bet (against 4 places). 5 Places = The standard amount of places is 4, however some people may want to back & lay 5, so they have created this market. This equals the places on Bet365 so you are safe laying here. If we didn't have the cashback then it'd be pointless using this market. The odds here will be lower than the 4 place market though, so you may choose to lay here to reduce the losses therefore retaining more of the £125. 6 Places = An extra market added for those who want to back & lay 6 places. AVOID. AVOID. AVOID. 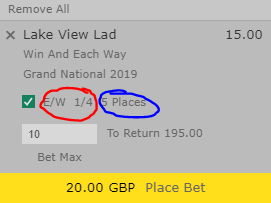 If you lay a horse here and it finishes 6th, you will lose ALOT of money in Betfair as the liability will be big, and you will also lose your Bet365 bet. NEVER lay above the amount of places on the bookie. Here we have 5 places on Bet365, so we lay 5 or less. Smarkets make things a lot easier and just have the exact places labelled on each one. So in the below example you're safe to lay the first two, but not the last market. For this offer, we are going to use the 4 places market. We can use 5 however the odds between 4 and 5 will be close, and if we use 4 then we will benefit from the extra places offer too if our horse comes 5th. To lay the bet, find out what the lay odds are in the 4 place market, and put the numbers in the calculator! Back stake, £10. Back odds, 4.5. Lay odds, whatever they were. And lay the bet! Easy! The easiest way to work out profit is to calculate the total qualifying losses, and take it away from £125. Lets say that £10 each-way bet cost me -£1.10 on the win market, and -£2.00 on the place market. I'm down -£3.10 and have placed £20 towards the £250 target. At that rate I'll be down around -£45 in qualifying losses, but I'll get £125 back in cash so am up +£80! Easy profit! And as an added bonus... because you layed the 4 place market, if your horse comes 5th you will win the £10 place bet (£45 return) and also the lay bet which will be around a £10 stake, so make an extra £55 or so! If there are any questions on this guide then please do ask on the dedicated FB post here. And remember, ALL BETS MUST BE PLACED BEFORE 12PM NOON ON SATURDAY!!!! Cashback will be credited within 2 hours according to Bet365, but from experience it can be added throughout the day, so make sure you keep a track of your total bets as they may already credit some of it which has caused confusion in the past. As long as you've bet £250 in total (£125 each-way), you should end up with £125 in your cash balance at the end!